All residents of Semmes are encouraged to check their voter registration to make sure it is current. Many people may have moved into our community recently, are first time voters, or their marital status may have changed since the last election, and they may have forgotten to update their voter registration. 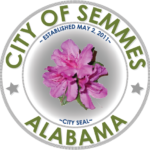 The City of Semmes is situated in Mobile County. The Mobile County Board of Registrars number is 251-574-8586 and their office hours are Monday-Friday from 8 a.m. to 4:30 p.m. Residents may also visit their website at http://mobilecountyal.gov/government/voter to obtain more voter registration information. Valid Employee ID containing a photograph of the elector and issued by any branch, department, agency, or entity of the Federal Government, the State of Alabama, any County Government, Municipality, Board, Authority or other entity of this state. Valid student or employee ID containing a photograph of the elector issued by a public or private college, university, in the State of Alabama (including postgraduate technical or professional schools). Valid US Military ID card provided that such identification card contains a photograph of the elector. Valid Tribal Identification card containing a photograph of the elector.